Bromine is a chemical disinfectant that can be used in swimming pools instead of chlorine. It is also commonly used in hot tubs and spas, because it can better tolerate the heat than chlorine. Although bromine is a better choice for those who have sensitive skin, there are some dangers that pool owners should be aware of before choosing to use this chemical. Bromine can be easier on the skin and eyes when used properly. Although bromine is generally easier on the skin and eyes than chlorine, there is still the potential for an adverse reaction. This reaction can include itchy, red eyes and irritation of the respiratory system. The amount used to keep pools and spas free of microorganisms and bacteria is low enough that most people are not bothered. 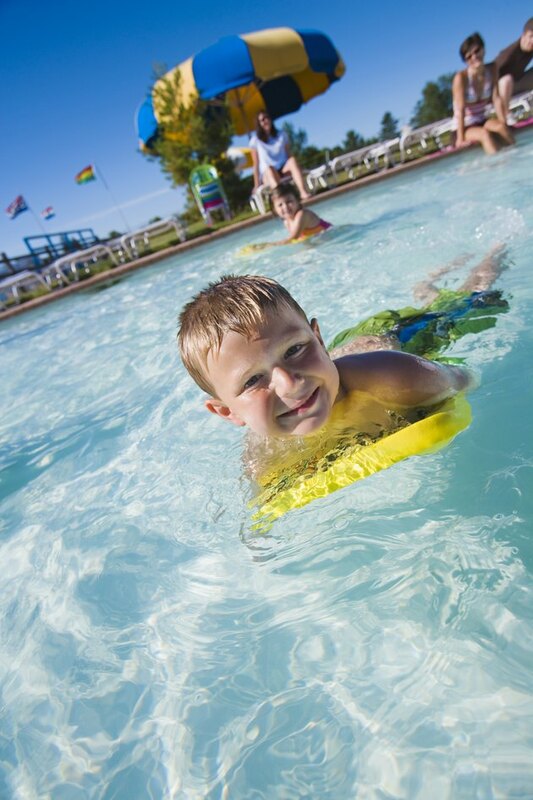 Numerous things impact the levels of bromine present in the water, including temperature, sunlight and the number of people who have been using the pool. This means that the levels of bromine are constantly fluctuating and must be tested. A safe level is between 2.5 and 4.0 parts per million (ppm). Because it is a bleach-like chemical, higher concentrations of bromine can cause the above-mentioned skin and respiratory reactions. Because bromine is constantly being removed from the water by environmental factors, simply waiting for the chemical to reach safe levels is usually the only control method needed. Improper use of bromine can lead to saturating the pool or spa with compounds called bromamines. Bromamines form when bromine combines with ammonia in the water; ammonia can come from several sources such as airborne contaminants and is typically carried on the skin of swimmers. When the bromine that is contained in the pool is converted to bromamines, it lessens the effect the chemical will have. Therefore, it is possible to have an acceptable reading but still have bacteria and other microorganisms that are not being eliminated by the chemical. In order to get rid of these bromamines, the pool or spa needs to be shocked regularly. Many dogs love nothing more than to jump in the swimming pool on a hot day, but the chemicals in the pool can irritate delicate eyes, nostrils and other mucous membranes. While bromine is generally easier on bathing pets than chlorine, it still can result in the irritation of a dog's sensitive system. Drinking pool water treated with bromine should be discouraged, and rinsing bromine water off pets as they get out of the pool is a must for keeping them safe and healthy. What Chemicals Are Used to Purify Drinking Water?